Fairy Tale Quincenera Theme Party. Someone is turning 15 and is over the top excited about their upcoming Quinceañera…it seems almost like a fairy tale now that it’s just around the corner. And a fairy tale theme makes for a beautiful and elegant fantasy you’ll never forget. Here’s how. What says fairy tale more than a fabulous castle? Just ask Rapunzel—the young girl who let down her golden hair to allow her Prince Charming to save her from the tower above the walled fairy tale garden. 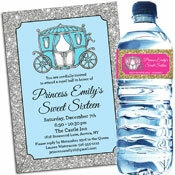 Send a personalized invitation featuring a castle and your guests will know they are in for a fairytale party! Another fun option are photo ticket invitations that will allow your guests and only your guests access to the castle! Want something even more creative and over the top? Let us do a custom caricature of you in a fairy tale gown (just send us a picture of any dress you like, and voila! we’ll draw you as a fairy princess with castle and coach to match). Use this for the invitation, the sign in/autograph board, centerpieces and more. A special entrance will start the party off perfectly. Choose metallic balloons and have bouquets around the party. Then add lighting in the colors of your choice in this space as well. Another great decoration that doubles as a special keepsake is a sign in area. Since this is a fairytale set out paper stars where guests can write a special wish for the birthday girl, and then they can place them on a "Wish Upon a Star" wall! You can also have one of the those wells that people place in their yards (decorate it with twinkle lights) and people can drop their wish into the "Wishing Well". There is also a fun crown theme sign in board available that matches this theme perfectly! 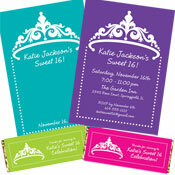 You customize it with your wording and date to make it a truly personal party decoration. Make your tables as magical as the rest of the room. Ask your venue to set your tables to match your decorations. White, silver and light blue is a great color scheme for a fairytale theme. Put your photo(s) on our one-of-kind personalized luminaries/lanterns that comes with a LED votive for illumination. Or you can fill the table with white votive candles and add fairytale castle confetti to the base of the centerpieces for a finished look. A move-around party is a lot more fun especially when you have all those areas of the castle to explore. Here’s a creative way to pull through your theme. The Great Hall Dinner Café Buffet - Put a castle wall behind your dinner buffet with bridge railings coming off either side for a great effect. Castle Confections - Using cloud patterned gossamer and spray glitter, make a backdrop for this dessert buffet that makes the desserts look even yummier. Use additional material over the buffet linen to match the backdrop. The Moat - Where you quench your thirst, of course. Using water patterned gossamer, create a moat that everyone must go to get that drink! Drape it across and behind the bar for a great look. While you may not have any games at your Quinceañera, there will be plenty of dancing. Make sure your stage and dance floor are decorated too! On either side of the stage, make windows and highlight the windows with twinkle lights. And consider ordering a lifesize princess cutout of yourself that you can attach to the castle waving from the window way up high! Not everyone has a candle lighting ceremony at her event, but they are becoming more and more popular. The tradition is to have 16 candles—15 for the most important people in your life and one for you. Make sure everyone remembers your special night with a favor. We love the personal touch of a custom photo cookie. A personalized candy bar with a beautiful castle on it is another sweet party favor. Or even this birthday crown mint tin where you can customize the wording. Very cute! Party411.com hopes you have a magical time at your Fairytale Castle Quinceañera!